Our nationalist stories about ourselves can be benign or dangerous – how can we tell the difference? 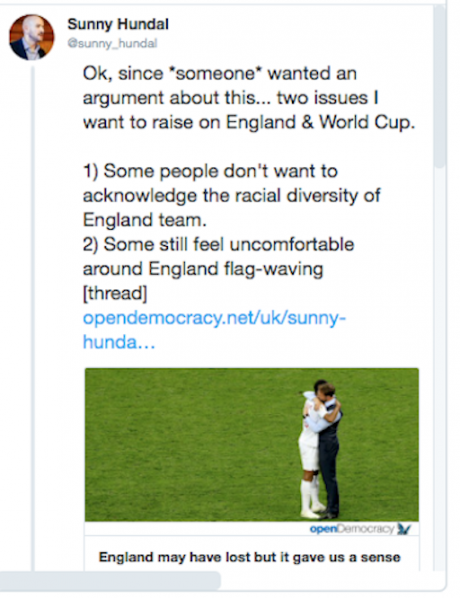 Why it is so difficult to differentiate between good and bad nationalisms, and why the World Cup might help us. Pt.2 of 4. Marcus Rashford and English manager Gareth Southgate after England's FIFA semi-final against Croatia. Aaron Chown/Press Association. All rights reserved. This is the second part of a 4-part article exploring the concept of the Monocultural National Us in Europe and beyond. See other parts here. Anthony Barnett wrote The Lure of Greatness; England’s Brexit and America’s Trump having long feared that England’s loss of faith in the once-glorious British project could become an enormously disruptive force, if the UK’s “long drawn-out constitutional and political impasse” was not resolved in a progressive way. Underpinning the constitutional question, the book is full of rich anatomies of nationhood and the yearning for nationhood, from Barnett’s recognition of Mark Rylance’s Johnny ‘Rooster’ Byron in Jez Butterworth’s play, Jerusalem, as an English hero for our times, to his uniquely sympathetic treatment (despite his own Remainer convictions) of the anger and frustration of those who voted to leave the EU. In these detailed descriptions of what it is in the modern world to want to be whole and free, he challenges his readers to recognise what is credible in the ‘take back control’ slogan of Brexit, leading us towards a vision of pluralist, networked nationalism that surely ranks among the ‘new forms of cooperation’ sought by Francesco Ronchi. Part of The Lure argument is predicated on a quest to draw a clearer distinction between ‘positive nationalism’, which qualifies us for joining the world, and ‘negative nationalism’ which is about being belligerent and exclusive. In this day and age of burgeoning nationalisms in most western democracies, there can be few lines that are more important to draw. Yet it is in the nature of these identity-formations that they are resistant to any clear breakdown of the interests at stake. Driven by desire, identity and emotions in ways that defy logic, they also have a capacity for mutation in either direction. What at one moment is considered a benign confidence-boost to enable us to look outwards with equanimity, might at the next be unpleasantly enjoyable as a punitive source of power and exclusion, or desperately needed to shore us up against fear of the Other. - The Times, meanwhile, wrote on their front page that ‘Harry heroics’ have allowed England fans to ‘dream the improbable dream’. - The Daily Mail’s front page declared: ‘Didn’t they make our lionhearts ROAR!’ with a picture of captain Kane and young England fans celebrating the goals. - David Beckham on Instagram on Panama fans: "Fantastic, that's why we love this sport, they lost 6-1 and look at this happiness". - The BBC has received a barrage of criticism in wake of England’s 6-1 win over Panama in the World Cup for “biased” commentary. In particular, UK viewers from outside England were disappointed by Danny Murphy’s use of “we” when referring to England. “We, we, we…” “BBC could do something about it. Bill McLaren never said “we” in 50 years commentating on Scotland." Clearly this is all about confidence, and not just that of the national team. Taking Barnett’s lead, we can distinguish between two different types of confidence at work here: the type that promises us in a hostile environment that we are at the centre of the only universe that matters; and the rather different type that gives us enough confidence to go out and be part of the world. 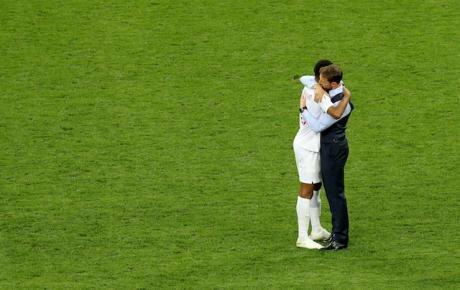 Given what is at stake, one of the great moments of drama for the English this season has been to watch Gareth Southgate, the England manager, as he negotiated the arc of national aspiration from its almost impossibly fragile and precious bubble of euphoria to the cold ashes of defeat. - BBC, July 14, 2018: Gareth Southgate says England are 'not a top-four team yet'… “It has been nice to receive a lot of praise but, balanced with that, we have had a lot of reality as well." He seems to have accomplished this difficult task with compassion and integrity, but the largesse of a winning trajectory can so easily be lost altogether. For once the bubble bursts, there is a danger that like the packed audiences of “Tory anarchists, romantic urbanites and frustrated suburbanites” who gave Johnny ‘Rooster’ Byron his many standing ovations, we will awaken as from a Midsummer Night’s Dream and ask ourselves where we have been. Screenshot. Twitter. July 18, 2018. But already in France, the commentators are asking how long the effect will last, and whether Emmanuel Macron overplayed his hand when in the heat of the moment he told journalists, as relayed by RTL: "I had asked them (the players) only one thing, bring back the World Cup home. They did it, I am very proud of them, of all the players". What does it matter? Football, you may say, is just a game. Yet the titillating sense of a dress rehearsal for life-and-death choices and realities is an essential part of the dynamic. Nobody can deny the sheer investment in the ‘beautiful game’, economic and emotional – personal, corporate, national and collective. These glimpses of the better nation that we are give millions of us the meaning and the bonding that we crave in our lives, if inevitably, some of the enemy images too. But for how long? What happens to the losing teams, or when the expectations don’t work? What I want to take from these World Cup examples, apart from the sheer emotional investment, is the mobility and brittleness in these identifications today, which makes what is to be gained by them so horribly close to what there is to lose. We are on a carousel which is gathering speed. We so nearly believe and then we don’t believe. We believe one minute and not the next. And each time we lose in a myriad of everyday aspirations, both the need to win and the difficulty of believing may be just that much more acute. As societies, we need to understand these everyday building bricks and dress rehearsals for nationalisms good and bad. If we rely on the eruptions of violence to signal the dividing line, won't we always arrive on the scene too late? There are other ways of enjoying football of course that are a bringing together of strengths, including the great strength which lies in vulnerability to the other. But this is the distinction I am making when I say that the Monocultural National Us is a clubbing together in strength of a great many potential weaknesses. It is this process that sets up the categories of Us and Them in the first place – ready for exploitation by national ideologies. Take the impulse to link foreigners to losers when it comes to attitudes towards Europe or migrants. The deep-seated fear of the loser within is projected onto a series of enemy images in the world at large, who are then deemed to threaten our wellbeing by claiming some kind of kinship. This refutation of the other, alongside more straightforward identifications – these are the natural building blocks that play an important part in the development of the distinction between the ego and the outside world. Literally they are what makes me, me. If I am confident in my identifications, then the world is likely to feel far less inimical: if I am feeling humiliated or powerless, this may well have me turning for consolation towards the amplification of my status on offer in the Monocultural National Us. Now look again at the impact on a whole society of decades of rising inequality leading to the kind of “political failure of historic proportions” that Sandel describes. In our relatively immobile winner-take-all societies, yes, people want to belong to a winning side. But behind this, there is the accompanying drama in which the stakes get exponentially higher as we become more desperate to believe in ourselves. Faith and despair, cynicism and gambling are equally rife in societies where there is nothing to be done. We can see this in the everyday logic of participation in elections, especially in first past the post systems. Voters of course think about the party political manifestos, the character of the leadership, behaviour of their representatives and the policies. But there is also a gambling circularity in any election, fed by polls and media commentaries, whereby people vote for the likely winner or out of a fear of who the losers are. They vote to find out whether they are losers or winners, and whenever people experience political impotence or personal humiliation, these stakes too rise that little bit more. My argument is that we dwell in an era unprecedented for its incomplete projections, its unbelief and dashed hopes. In our societies majority reassurance never works for long: wars don’t ‘work’ as they once did despite ever more lavish commemorations; peace never arrives. Enemies proliferate without any sense that we are secure in our own fortifications or united in our self-defence. You may well ask if this isn’t less dangerous than full-blown and self-satisfied completed projection. But both conditions have their dangers. The most complete projection, I suspect, is never entirely complacent. While in the incomplete version, a stubborn devotion to the worst elements can linger on, regardless of the gradual hollowing out of everything that enriched it, until we have zombie world views and deeply frustrated and insecure subjectivities. Neoliberalism, as we know, places the burden of shame and defeat as well as the fear of precarity ever more firmly on our own individual shoulders. With increasing desperation we turn to another strong leader, another collective show of force, even another World Cup. But with the best will in the world, unifying Brexit Britain through football is even less likely to work than through the act of voting. I hope my colleagues at openDemocracy will forgive my further unsuspected scrutiny of their views on good and bad nationalisms. But I would like to close this section with an informal clash of opinion that took place in our ‘comments’ space between oDUK editor Caroline Molloy and founding editor Anthony Barnett. 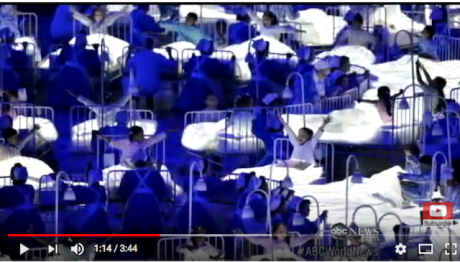 Caroline Molloy had written another splendid article about the NHS, and more particularly, the utterly cynical way in which Tory anti-NHS legislation and May’s announcements of her ‘hostile environment’ – both of which consciously undermine the NHS, were the backdrop to Danny Boyle’s 2012 Olympics NHS montage – invoked by Zoe Williams in this Guardian article as an icon of ‘good nationalism’. The exchange goes on: Molloy is willing to back post-colonial nationalism but not English nationalism which for her leaves out most of the salient facts. She concedes that the Tories have to marketise and destroy the NHS in a particularly sneaky way because “of the centrality of healthcare to us”, but is not comfortable with Barnett’s respect for these belief systems, even if millions have died for them. Molloy cannot believe that Barnett doesn’t see the motives and exclusions served by the fiction of a good English nationalism; and Barnett cannot understand that Molloy should have so little respect for the profound shaping impact in our lives of these imagined communities, answering as they do to the deepest economies of desire. So here we have a curious stand-off. Anthony Barnett has devoted so much of his working life as a campaigner and educator, to codifying the uncodified constitution, equipping our nations and nationalisms with the institutions, constitutions, governing principles, not to mention media, they will need. Who knows better the many nefarious purposes that might be concealed within the uncodified variety? Yet despite and indeed perhaps because of this comprehensive work of deconstruction – I am using the word although I know Barnett will hate it – he clearly remains and wishes to remain susceptible to the siren call of a ‘good nationalism’. At the time of the 2012 Olympics, there were plenty of critical voices of ‘Danny Boyle nationalism’ among all the plaudits. One neighbour of mine thought it strangely repugnant that the image of sick children should be so central to it. Others pointed to the absence of any reference to British imperialism in Boyle’s selective history – precisely to the absence of things that divide in Molloy’s account. But here centuries of sacrifice that people have made for their country prevents Barnett from seeing how this imagined community also represses major contradictions in the way we live. More than a contested belief, it is a fiction that glosses over the conflicts that are going on, and that also make us what we are. For her part, Caroline Molloy, openDemocracy’s OurNHS editor over many dedicated years has done more to fight for the survival, nay flourishing, of our national health service than anyone else I know. Yet she turns her back on the elements of this belief system that contain hugely important and still potentially subversive potential for change. After all, if we are to imagine our community in one way or another, surely the “core principle that people got comprehensive healthcare on the basis that they lived here, and needed it, that had endured since 1948” – the image that Molloy tells us May is out to destroy and that unsurprisingly raised Tory qualms when it was first proposed as a centrepiece by Danny Boyle – is as good a self-image to fight for as any. So in this small but heartfelt encounter we have an example of the elusive power of the Monocultural National Us, and its ability to turn us upside down and inside out, even in these febrile times when it is becoming increasingly obvious that on their own, these collective identifications are simply not enough. We cannot live with them or without them? What then do we do with them? There is no accident that the NHS shares with the BBC, that other icon of Britishness, the intention to provide universal and equal access across the huge diversity of a nation. Here is Tony Ageh, former Controller of Archive Development at the BBC and before that of BBC internet, on Auntie’s early promise, “ to Inform, Educate and Entertain EVERYONE, equally and without systemic privilege or favour. No matter who you were, or where you lived, or how rich you were.” Now, both institutions are in crisis. In the case of the BBC, universal relevance has become an etiolated impartiality that is gradually foundering on the rocks of Us and Them. For the NHS, a fundamental economic solidarity is being hived off by privatisation. But doesn’t the principle remain a living challenge to the powers that be, a worthy national aspiration, turned by the times we live in into a subversive if half-submerged vision of what, in all our differences, we still could be together? In this case, admitting much of Caroline Molloy’s case that we could never have built the NHS on our own, and her warning that English nationalism is too often about “forgetting”, can we begin to draw the line? Could we say that a healthy nationalism, if it is to avoid the violence at the beck and call of bad nationalism, must be generous, curious and open to the outside world from which it cannot be detached, while also responsive to the huge diversity, including the contradictions, within its own domain? Might we add that the deceptively innocent manoeuvre of turning away from diversity for the sake of ‘cohesion’ which we saw when multiculturalism was rejected, runs the danger of crossing the line? All of which gets particularly pressing when you are trying to defend, as Zoe Williams is for example, a “bordered civic identity”. In short, we need to be extremely vigilant about cultivating an authoritarian “left patriotism” not very different from that of the right. We should resist the seductions of a “national unity government”, until we can be convinced that this is not just the latest managerial design of the nation state on our emotions, but that it will genuinely serve our diverse interests. We should cling to the challenge of a unity that can embrace “EVERYONE, equally and without systemic privilege or favour” and face the contradictions and conflicts that this creates for all of us. Screenshot: YouTube. Britain's national healthcare system at the opening ceremony of the London 2012 Olympics.